The evening series is organized and supported by the AAMC Foundation. The open discussion format welcomes AAMC leadership, non-profit leaders, and voices from local communities to have an engaging dialogue on a focused subject. Following the discussion, AAMC welcomes the audience and speakers to continue the conversation at a brief reception. Past events have included: Digital & Outward Engagement, held in Philadelphia; Role of Art Organizations, held in New Haven; Multiple Voices to Build Inclusion, held in Seattle; Behind the Career Curtain, held in Chicago; Spark: Igniting Curiosity, the Curator's Impact, held in Toronto, Art and Social Justice, held in Los Angeles, Addressing Implicit Bias in Museums, held in Washington, D.C.; Preventing Looting: What Curators & All Museum Staff Can Do held in NYC, and Museum Directors on the Curatorial Role, held in Boston. Sign up here to receive AAMC updates, including future In-Conversation announcements. In bringing this program together, we sought to discuss the methods and voices developing digital engagement in our non-profit organizations. Moving past social media and traditional websites, we dug deeper into the ways in which technology can help advance dialogues with visitors, donors, colleagues, and the larger global community. Our conversation served as a forum on the current efforts and platforms in the digital sector, and considered ways in which they could help us better connect with our audiences. With a considered look at the topic from varying perspectives, we also discussed ways in we could be collaborating our efforts as well. This discussion was moderated by Christopher D.M. Atkins, Ph.D, Agnes & Jack Mulroney Associate Curator of European Painting & Sculpture and Manager, Curatorial Digital Programs & Initiatives, Philadelphia Museum of Art and features Aaron Miller, Senior Producer, Digital Media, The Franklin Institute; William Noel, Associate University Librarian & Director, Kislak Center for Special Collections, Rare Books and Manuscripts Director, Schoenberg Institute for Manuscript Studies, Penn Libraries; Ariel Schwartz, Kathy and Ted Fernberger Associate Director of Interactive Technologies, Philadelphia Museum of Art; and Susan Lubowsky Talbott, Executive Director, The Fabric Workshop and Museum; Neville Vakharia, Program Director, Arts Administration Campus Program and Associate Professor and Research Director, Drexel University, Westphal College of Media Arts & Design. This event was hosted generously in part by Philadelphia Museum of Art. In this discussion, we looked at what role art organizations currently have and should seek to have within society, as well as acknowledging our responsibility to our communities. With changing audience demographics, funding challenges, declining member numbers, shifting donor motivations, increasing online engagement, and differing visitor expectations, including a growing preference for experiences over objects, organizations are reassessing how they can best serve and be relevant to their communities. Together, we considered ideas around promoting and interpreting our collections and exhibitions in an accessible way, preserving our works and honoring our histories, providing meaningful educational opportunities, and connecting with the public. In addition, we explored new models of engagement, including hosting a wide array of community programs as opposed to only presenting our own orchestrated offerings, working to become a vibrant, cultural gathering place, and serving as a facilitator of dialogue around socio-political issues. This discussion was moderated by Michelle Hargrave, Deputy Director, New Britain Museum of American Art; Moderator and features Maria Falvo, President & CEO, American Savings Foundation; Cybele Maylone, Executive Director, Aldrich Contemporary Art Museum; Frank Mitchell, Executive Director, The Amistad Center for Art & Culture; Jennifer Reynolds-Kaye, Curator of Education and Academic Outreach, Yale Center for British Art; and Elizabeth Shapiro, Interim Director of Culture Director of Operations, Preservation and Museums, Connecticut State Department of Economic & Community Development, Offices of Culture and Tourism. This event was hosted generously by the Yale Center for British Art and the Yale University Art Gallery. Throughout the arts we are working towards addressing inclusion within our exhibitions, collections, and overall work. Advancing the conversation takes a community, one that goes beyond curator-to-curator conversations. Increasingly museums are seeing the benefits of including others in the planning process—not only colleagues within our own museums but our audience, artists, supporters, students, leaders, and collectors. During this roundtable discussion, we looked into examples of how bringing varying perspectives together is working to change our arts organizations and the programs we offer. This discussion was moderated by Chiyo Ishikawa, Susan Brotman Deputy Director for Art, Curator of European Painting & Sculpture, Seattle Art Museum, and featured Ping Foong, Foster Foundation Curator of Chinese Art, Seattle Art Museum; Rodney Hines, Director of Social Impact for U.S. Operations, Starbucks; Elisheba Johnson, Project Manager of Public Art, City of Seattle; Tracy Rector, Indigenous Media Activist, Filmmaker and Curator; S. Surface, Curator, Designer, and Lecturer; Xiaojin Wu, Curator of Japanese and Korean Art, Seattle Art Museum; and Emily Zimmerman, Director, Jacob Lawrence Gallery. This In-Conversation was generously hosted by the Seattle Art Museum. These notable local voices from the for-profit and non-profit sectors will engage in an open dialogue with attendees about creating, maintaining, and achieving a rewarding career in the visual arts world. Utilizing the experiences of the panelists as launching points, topics will include education tracks, expectations, best practices in job searching and hiring, and the struggles of balancing the demands of an all-encompassing field. The information shared will be valuable to those at any stage of their journey, and provide a behind-the-career look into the arts. The discussion featured Katelijne de Backer, Director, PULSE Art Fair; Lisa Corrin, Ellen Philips Katz Director, The Mary and Leigh Block Museum of Art, Northwestern University, Judith Pineiro, Executive Director, AAMC & AAMC Foundation; and moderated by Madhuvanti Ghose, Alsdorf Associate Curator of Indian, Southeast Asian, Himalayan, and Islamic Art, The Art Institute of Chicago; Vice President of Governance & Nominating, Board of Trustees, AAMC & AAMC Foundation. This program was generously hosted by Christie's. Curators are intensely aware of the ways in which the research, collection and presentation of art creates value, sparks interest, and establishes meaningful aesthetic experiences. This responsibility is at the core of curatorial work, yet often under-emphasized. Recognizing the role that collection building, exhibition conception [or, ideation] and design, digital platform enhancement and virtual audience expansion has in how our communities interpret and appreciate art is a critical aspect of curatorial work. Equally important are current discussions of inclusion and access through art, as a key way of developing curatorial projects. Moderated by Sophie Hackett, Curator of Photography at Art Gallery of Ontario and Adjunct Faculty in Ryerson University's Masters' program in Film and Photography Preservation and Collections Management, the discussion featured: Nancy Campbell, Independent Curator; Deepali Dewan, Dan Mishra Curator, South Asian Arts & Culture, Royal Ontario Museum; Luis Jacob, Artist, Curator & Writer; November Paynter, Director of Programs at the Museum of Contemporary Art Toronto Canada; and Filiz Çakır Phllip, Curator, Aga Khan Museum. This program was generously hosted by the Art Gallery of Ontario. 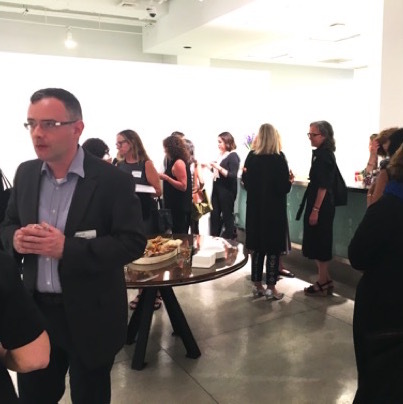 The Association of Art Museum Curators (AAMC) Foundation hosted an important program entitled In-Conversation: Art & Social Justice. This timely and important roundtable discussion focused on the arts and curatorial interventions as direct and active vehicles for social change. The event brought together five prominent arts leaders to have a conversation around the power of art - created and presented by artists, arts organizations, scholars, activists, and of course, curators - to instigate action, produce impactful outcomes, bring attention to critical issues, and open conversations by offering different points of view. The discussion featured David Gere, Professor, Department of World Arts & Cultures/Dance University of California, Los Angeles; Naima Keith, Deputy Director, Exhibitions and Programs, California African American Museum; Bill Kelley, Jr., Lead Curator and Researcher, Talking to Action, Ben Maltz Gallery, Otis College of Art and Design; and Pilar Tompkins Rivas, Director, Vincent Price Art Museum; and is moderated by Mary (Polly) Nooter Roberts, Professor, Department of World Arts & Cultures/Dance, University of California, Los Angeles, and Consulting Curator for African Art, Los Angeles County Museum of Art. This is a subject that the AAMC Foundation and program moderator had been dedicated to even before the recent political upheavals. Now it is more urgent than ever to consider how curatorial practices can be a catalyst for addressing issues of social justice and civil liberties. This program was sponsored in part by Christie’s, and generously hosted in part by LACMA. 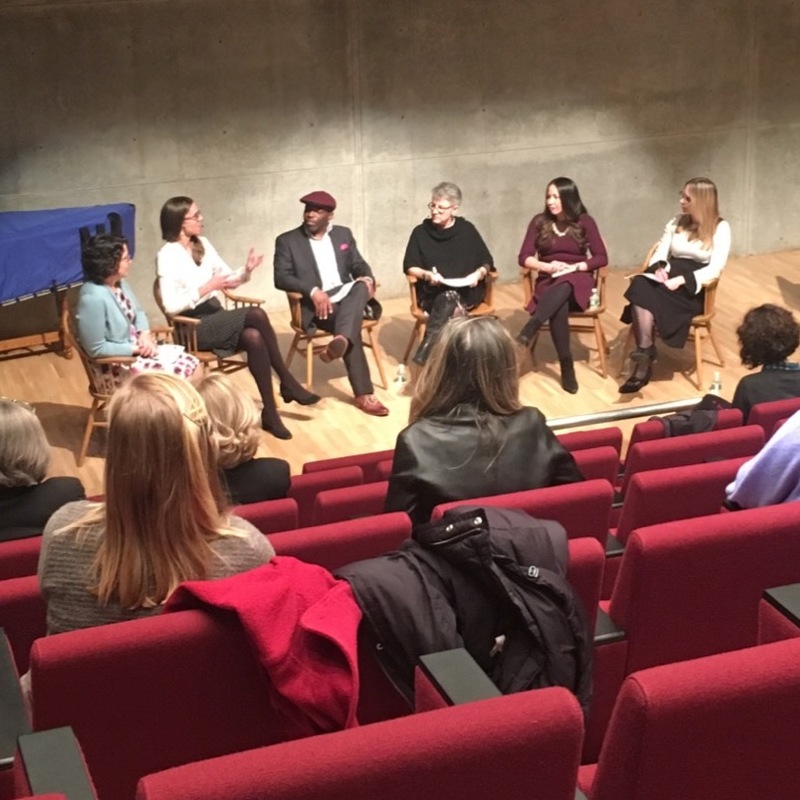 This discussion featured leading museum professionals, bringing diverse perspectives to bear on the topic of unintended bias and offer their insights about meaningful and impactful ways to address the issue. Unconscious beliefs and values with regard to race, gender and/or class often impede efforts to advance inclusiveness and equity in art museums. The implications of unintended biases are wide-ranging, from lack of diversity among museum trustees, staff and audiences to exclusionary practices of collecting, display and interpretation. 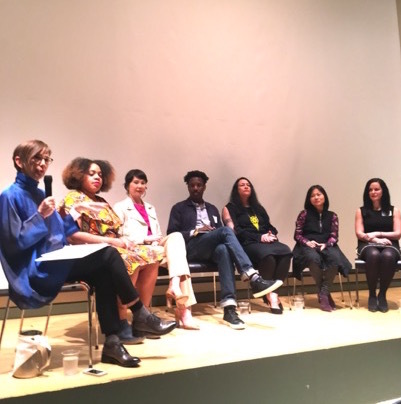 Panelists discussed how cultural and social privilege is reflected in museums, discussed how to identify and change normative patterns of behavior that impact decision-making, and what we as curators can do to effect change in the museum world and beyond. This discussion featured: Christa Clarke, Senior Curator, Arts of Global Africa, Newark Museum, Moderator, President-Elect, AAMC & AAMC Foundation; Eduardo Díaz, Director, Smithsonian Latino Center; Elizabeth Easton, Co-Founder and Director, Center for Curatorial Leadership; E. Carmen Ramos, Curator of Latino art, Smithsonian American Art Museum; Kimberly J. Wilson, Deputy Director Human Resources, Volunteers, and Community Service, Virginia Museum of Fine Arts. A video welcome address was delivered by Dr. Johnnetta Betsch Cole, Director of the Smithsonian National Museum of African Art. This program was sponsored in part by Christie’s, and generously hosted by the Smithsonian National Museum of African Art. Three museum directors, new to the Boston area, discussed the role of the art museum curator. Moderator John Ravenal (deCordova Sculpture Park and Museum) and panelists Martha Tedeschi (Harvard Art Museums) and Matthew Teitelbaum (Museum of Fine Arts, Boston) held a lively conversation on their views of the curatorial profession--the challenges and opportunities; balances in presenting western / non-western and modern / non-modern; and how the role of curator has changed, what should change, and what lies ahead. The event was sponsored in part by Christie's, and held at the Harvard Art Museums. The inaugural In-Conversation program, presented by AAMC Foundation & the US committee of the International Council of Museums (ICOMUS), featured leading figures involved in the protection and preservation of cultural heritage sites and artifacts aimed at informing and engaging curators and those interested in their role on ways they can have an impact on this issue. The discussants included Emily Rafferty, emerita president the Metropolitan Museum of Art who is active with U.N. cultural heritage efforts; Lisa Ackermann, Executive Vice President and Chief Operating Officer of World Monuments Fund, a leader in preservation efforts around the globe; Ian Wardropper, Director, The Frick Collection, museum director and curator whose expertise includes many areas related to cultural heritage; and Edward Bleiberg,Curator, Egyptian, Classical, & Ancient Near Eastern Art; Managing Curator, Ancient Egyptian, African, & Asian Art whose areas of responsibility include many closely involved in present day conflict and looting; and Sandra L. Cobden, SVP, General Counsel, Dispute Resolution & Legal Public Affairs, an expert on legal issues relating to the preserving cultural heritage. Helen C. Evans, President AAMC and AAMC Foundation and Mary and Michael Jaharis Curator for Byzantine Art at The Metropolitan Museum of Art will moderated discussion that addressed what curators can do regarding cultural preservation in areas of current conflict as well as globally. The event was sponsored in part by Christie's, and generously hosted by The Frick Collection. These programs are organized and presented by the Association of Art Museum Curators (AAMC) and AAMC Foundation. We are grateful to Christie's for their support of our In-Conversation programming.The information presented here is subject to change without notice. The organizers assume no responsibility for any errors that may appear here, and in no event shall the organizers be liable for incidental or consequential damages arising from use of this document or other program-related material. This document and parts thereof must not be reproduced or copied without the organizers providing written permission, and contents thereof must not be imparted to a third party nor be used for any unauthorized purpose.